My 6-year old son loves Supasave donuts. Supasave supermarkets sell their donuts ball-style and not the traditional ring-donut style - you know, the ones with holes in the middle. For some reason, my son likes to eat his donuts whole rather than biting into a ring-type donut. As for me, I got bitten by the donut bugs when I was studying in the States. I have to go pass this Dunkin' Donut place everyday and every so often I would drop in there. At that time it has this offer of a free donut for every 5 that you buy or at some other time of the day, it would have this buy one get one free offer. The donuts are not just round but filled with many fillings such as custard, chocolate etc. Man, those were the days. Incidentally, a plain donut contains around 300 calories. On average, it takes about a mile walk to burn off about 100 calories. So 300 calories is about a 3-mile walk and half a dozen of them donuts, are ....(ehem).... By the way, a sugared donut is only about 305 calories! So you might as well sugar them. It does not make that much of a difference. I have not tried out our local Dunkin' Donut at Batu 1, Jalan Tutong. I went there once I think, but the atmosphere was a lot different than the ones I often go to in the States. How do you actually spell Donut? And where does the word come from? Who invented them? Why do they have holes in the middle? So many questions. But I have the answers. The correct spelling is 'doughnut' but Americans spelt them 'donut'. Donuts apparently are not recent creations and archaeologists in the American Southwest apparently found 'fossilised' fried cakes with holes in the centers dating back to prehistory. 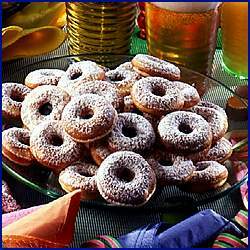 The modern donut form actually comes via Holland where they are called olylkoeks (oily cakes). The Dutch made them by frying left over bread dough in hot oil. The Dutch pilgrims took them to America in the 19th century. However in America, at that time, the dough were made into little 'knots of dough' or 'nuts of dough' to be fried in oil - and that's where the name 'doughnuts' came from. So, why the holes? The oil cakes apparently being thick are always a little uncooked in the cente, so a hole was made so that the doughnuts will cook all the way through. Some say that this was started by a seacaptain in Maine USA who asked his mother to remove the centre so that he can keep the cakes on the handle of his ship's wheel. This was around mid 19th century. Though there have been many arguments about that version. But Whatever it is, by the First World War, American troops fighting in France loved the holey donuts as they can carry them on their gun barrels to keep their hands free. In some stories, this is why the soldiers were known as the 'dough boys'. Since donuts are just plain dough deep fried, any fried dough theoritically belongs to the same donut family - so, by extension, our beloved 'chakoi' is a donut. You can just about imagine it, chakoi slopped with margarine and kaya is always a local favourite. However the more familiar looking local donut is the the local Brunei donut called 'kueh keria'. It has the same shape as the donut but the major difference is that the American donut is made from dough, the local Brunei ones are made from mashed sweet potatoes and mixed with dough. This is also fried and rolled in sugar. The only difference is the taste. But whatever it is, the calories count in them is still high! So, given the choices between donuts from Dunkin' Donut and donuts from Krispy Kreme - which are nicer? Is there still a Dunkin' Donuts in Brunei? I thought they all closed down. And Krispy Kreme is absolutely heavenly! They'll make you forget all about SupaSave's donuts! I remember there was a Dunkin' Donut at Yayasan. It closed down already. But much prefer to get down to Hua Ho and have their round mini donuts. Yea as far as I know they're gone (Dunkin Donut). Used to love their Bavarians. dunkin donuts doesn't even compare to krispy kreme! i think krispy kreme uses crack cocaine in their icing. that's why i keep wanting to eat them everyday. hehehehe or some kind of drug anyway! because the staff are way too nice. I kinda like them both...DD if you are looking for something light and don't want a sugar rush (and eventually the headache)...and KK for the serious high. The 'Donuts' in Medina is a taste to remember. I dont remember the name of the shop but I think it was called Donuts Palace. The local donuts is also nice. Different from the western incarnation. New York, NY -- September 26, 2006 – The low-fat donut has been the Holy Grail of the food industry. Food companies have been able to take most of the fat out of everything from cheese to Twinkies, but no one has succeeded in designing a marketable donut that dips below 4 grams of fat per serving before now. Over 18 varieties of donuts and mouth watering cinnamon buns are currently available for ordering on-line across the country at holeydonuts.net.